Hitting the streets in workout gear wasn’t easy our first morning in Bogotá. We’d been up for 25 hours straight the day before (with gracias to late-partying Andres Carne de Res, the 2,000-seat steakhouse and dance club outside Colombia’s capital city). But the morning light was sharp, the mountains dramatic, and the streets clear. 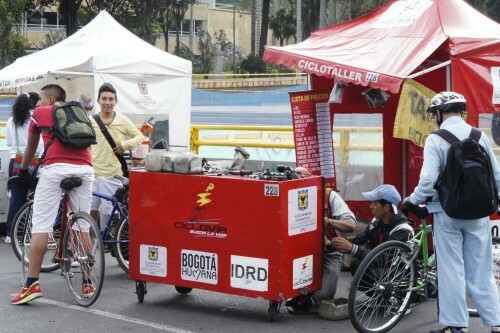 This was Ciclovía, another famously car-free Sunday in South America’s bike-friendliest city. We were about to experience what my cousin Jan, who works in Bogotá, had called her favorite aspect of life there. Our energy ticked up immediately as we plunged into the current of cyclists, runners, and a few rollerbladers. The flow was so constant we had to look both ways and wait to avoid hit by all the motorless traffic whooshing along Carrera Séptima, one of the city’s busiest avenues. Vendors set up little tents for bike repair, and carts sold snacks along the way. Many sold Colombia’s abundance of fruit; one barked endlessly about his watermelon (“Sandía sandía sandía!”) through a tinny megaphone. Not everything was healthy. We could smell empanadas and even hamburgers frying. Although Bogotá’s 8,000-foot altitude makes it appealing for athletes, including cycling champions, it hasn’t been endless fitness in the city. The weekly Ciclovía, started 40 years ago, has prompted many Bogotanos to start exercising, our friend Andrés’ father, Hermán Carrillo, explained. It was hard to imagine that now given all the Lycra we saw. 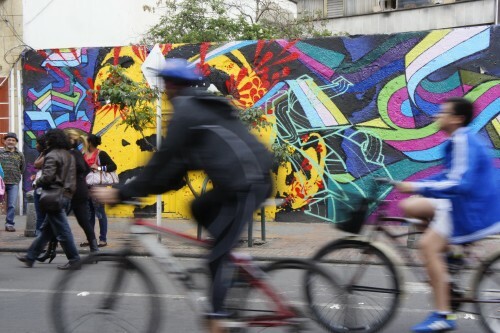 At least 1 million people are estimated to take part in the Ciclovía every week. Its atmosphere gave us—and the city all around—a feeling of both energy and relaxation, like a floating a lazy river or running a big race without all the rules. The feeling rolled on into Monday as we took a long bike tour. Cars and endless motor scooters were hitting the streets with us, but we could often pedal comfortably in Bogotá’s nearly 200 miles of ciclorutas, or dedicated bike lanes. Having lived in Chile, traveling the continent from there, we’d certainly call this the most pedal-forward city in South America. This weekend we’ll be checking out Montreal, the bike-friendliest city in North America. Stay tuned!